This product includes 5 ELA centers that are perfect for back-to-school time in first grade! The skills include a review of kindergarten reading skills while incorporating first grade standards. 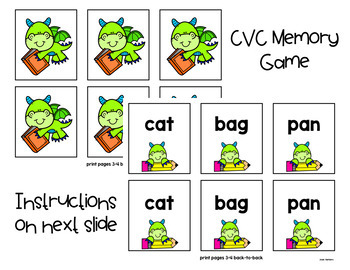 These centers are great because your new first graders can complete them INDEPENDENTLY-perfect for the craziness that comes with the first few weeks of school! Please read the list below to see exactly what is included with your purchase! 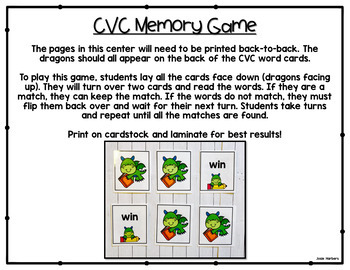 -CVC memory game: students will lay all of the cards face down and flip two over at a time, looking for CVC words that match. -Fill in the blank in each sentence (with picture clues): Students read the sentence and look at the picture clue, then find the word to fill in the blank. 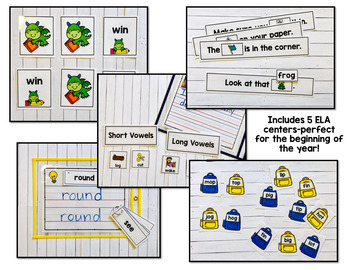 -Short vowel vs. Long vowel sort: students sort each word based on the vowel sound. Includes a writing sheet that can be completed after. -Backpack rhyming word match: students look for the two backpacks that rhyme. If you have any questions about this product, please ask prior to purchasing! If you do decide to purchase this product, please leave feedback! Not only is it valuable to me, but you will also earn TpT credits to apply toward future purchases! You might also like my Editable Reading Center Rotation Wheels!